This one product serves as a nasal interface, an oral interface, and a combination of the two. 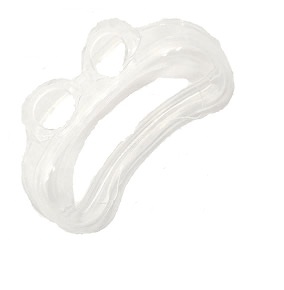 The Hybrid is a dual airway interface for use with positive pressure ventilation devices for the treatment of respiratory insufficiency and obstructive sleep apnea. Product Features The unique design of the Hybrid promotes comfort by eliminating pressure points on the forehead and across the bridge of the nose. A built-in chin flap gently supports the chin for stabilization and fit. The Hybrid complete system contains all sizes of all components. Universal Design- the unique design of the Hybrid combines the best features of both a nasal pillow system and a traditional full face mask. It offers all sizes and multiple combinations for easy flexible fitting and is designed for quietness and comfort. 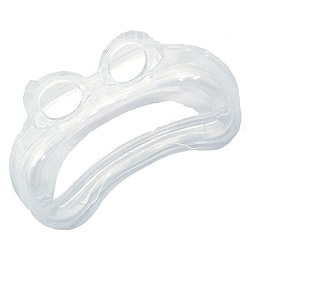 No Nasal Bridge or Forehead Contact-glasses may be easily worn, and nasal bridge sores and air leaks are eliminated. Hybrid Complete System Contains All Sizes of Pillows and Cushions-numerous combinations of sizes are possible for a personal fit.